This week I’m covering the top 8 and because I split this Second Trimester Report over 2 weeks, I have kept all the stats locked as at Round 16. It is hard to ignore the results of round 17 though, especially for teams like the Broncos. The Panthers are a slightly upmarket version of the Tigers this year with the size of the Warriors. Sounds like some sort of mythical beast. Their win/loss streak is, from round 1 to round 18, LLWLWLWLWWLLWWLL (sounds like Morse code). The games are always close and they win as many as they lose. When you see them play you realise why. They are epically talented but are still learning what it means to grind out games. They have a limited sense of game awareness and just when they seem to be wresting control they spill the ball employing some high risk play. Conversely, they will fall behind, employ the same tactics and come firing back. Part of the reason is that Anthony Griffin has gone all-in on youth and given central roles to Te Maire Martin, Waqa Blake, Nathan Cleary, Leilani Latu and Bryce Cartwright while players like Jamie Soward, James Segeyaro and Elijah Taylor have been released mid-season. Peter Wallace has been re-tasked to good effect as well. Matt Moylan – Brilliant but (so far) injury prone, Moylan is the spark that lights the Penrith fire. Honourable mention to Leilani Latu, Bryce Cartwright and Nathan Cleary. With no sign of a Warriors-like win streak on the horizon, the Panthers will keep trundling along looking awesome one week, less than awesome every other week and generally keeping things interesting. They should sneak into the 8 but that is all we should expect. There is a fair gap between them and the contenders. The Raiders are so underrated they are overrated (credit to Bill Simmons). Apart from Josh Papalii they are virtually ignored at Origin time, a significant upside to their strategy of recruiting blue chip overseas players. If anything, the Raiders grew on their First Trimester performance, leveraging off the Origin period with a 4-2 record. Papa Bear has been playing well, as has Josh Hodgson but it is the form of the outside backs including Jordan Rapana and Joey Leilua that really led the way. Joseph Tapine is starting to find his feet as well. Jordan Rapana – It is rare for a winger to be the best player on the team but in the past few weeks Rapana has shone brightly including last week where he snatched the game in golden point for the Raiders. As well as they are playing, and that is better than last year, the Raiders are in that clasp of sides that should make the 8 (also including the Panthers and the Warriors) but probably won’t do much once they are there. They may cause an upset or two but I can’t see them winning the GF. Making the 8 and playing Finals Football is still a big step for them though. You could copy and paste exactly what I said in the First Trimester about the Bulldogs until they flogged the Broncos. They were beating most of the teams they needed to beat (Tigers, Roosters and Dragons) but losing to teams around them on the ladder (Raiders and Sharks). The performance against the Broncos was a bit of a watershed. Up until then they didn’t ever really look convincing. They played well in patches but they didn’t really bully anyone around. Having said all of that, now I’m thinking that the Bulldogs caught the Broncos in an epic form slide (losing 5 of their last 6). No-one is really standing out but the whole team is playing well, if that makes any sense. The forward pack is solid with Josh Jackson, James Graham, Aiden Tolman and Sam Kasiano (AKA Dogzilla – I love that name) all having their moments. Josh Reynolds and Moses Mbye have also played well in patches. Both Morris boys are back now too. Josh Jackson – Solid but rarely spectacular, Jackson was rewarded with a State of Origin jersey this season and typifies the across-the-board effort Canterbury have been putting in. During the First Trimester the real contenders were the Broncos, Storm, Sharks and Cowboys with the Bulldogs on the outside looking in. The Broncos have drifted but the Bulldogs are still in the same position, flying under the radar. They have the cattle to win the whole thing but have a few too many question marks to claim contender status. Obtaining a spot in the top 4 will enhance their claims but they need to show more consistency against the big clubs to show they can make it out of the second week of the Finals. Is it time to panic? The Broncos are playing very un-Bronco like Rugby League at the moment. Last season and for nearly all of the First Trimester, the Broncos maintained an iron curtain-like defensive line which only strengthened in the red zone. The first half against Cronulla was the first sign of a defensive fragility which has again emerged in big games against the Bulldogs and the Storm. 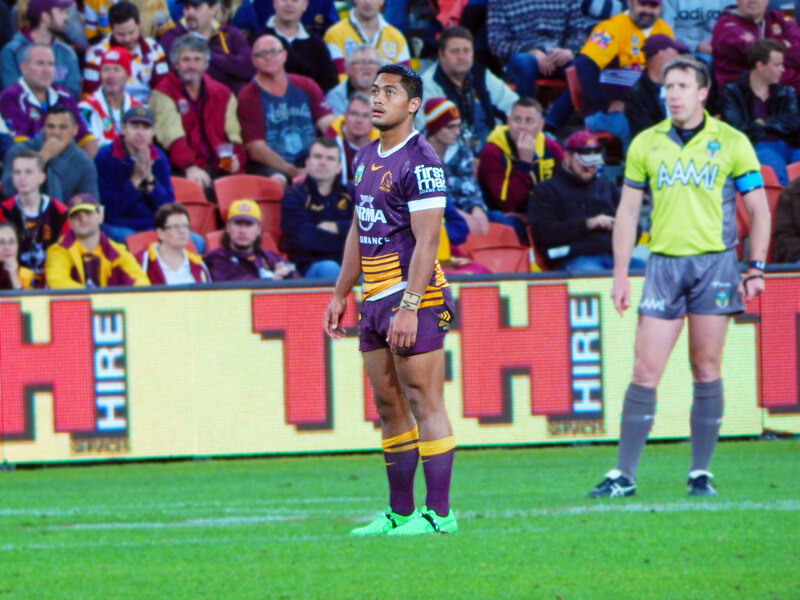 Ben Hunt has regressed in a big way and even Anthony Milford’s confidence looks shaken. Some of this can be put down to Origin and the lengthy absence of Andrew McCullough but that doesn’t answer all the questions. Darius Boyd – Boyd is the complete package at Fullback with his ball playing a particular feature of the Second Trimester. Wayne Bennett coached sides should never be written off but this side is definitely under pressure. They don’t have a terribly taxing run into the Finals so should be able to regroup and make the top 4 but real questions have to be asked regarding their premiership credentials. At this stage, without a dramatic improvement, they will be making up the numbers come Finals time. In 2015 it was the Titans wracked all season long with controversy. In 2014 it was the Sharks. This year the Eels are mired in salary cap breach-land with no end in sight. The NRL finally handed down their 12 point penalty on the weekend which puts them well out of the 8. But the collateral damage is immense. Kieran Foran has allegedly walked out of the club but his year has been horrendous with personal issues, a hamstring injury and now a season ending shoulder injury already blunting his effectiveness. Nathan Peats and Junior Paulo have moved on to deal with the salary cap problems. Speculation around Jarryd Hayne’s return continue to swirl. They also have a long injury list robbing them of most of their depth. Add to this all of the drama surrounding Semi Radradra which includes domestic violence charges, suspicions he is primed to flee to Rugby in France and now a long term injury. Corey Norman has criminal charges to answer. Despite this they have remained competitive on the field. Brad Arthur must take a huge slice of credit for this. On the field, Corey Norman, Michael Gordon and Manu Ma’u have been the standouts. Corey Norman – Playing the best out of the Eels, he has incrementally improved season by season. Their season is effectively done. Bill Simmons calls a situation like this the Tyson Zone. It basically means that anything that is reported from here on in will not shock you. Kenny Edwards is from Mars. Not surprised. Isaac De Gois is actually 352 years old. Not even raising an eyebrow. The Eels won’t be playing Finals football and they have officially entered the Tyson Zone. In my First Trimester Report, I drew parallels between the Golden State Warriors (at that time hurtling towards a second title) and the Cows (also seemingly hurtling towards a second title). I’m hoping that comparison won’t hold as the Dubs stumbled at the last possible moment. The Cows haven’t exactly stumbled during the Second Trimester with a 3-3 record but going down narrowly to the Storm (15-14), Dragons (14-10) and Sharks (13-10) in winnable games has blotted their copybook. They have drifted in betting behind the Storm and are on equal odds with the Sharks. That is a fair call. Both JTs are still playing the house down. Origin has been disruptive. They aren’t putting teams to the sword but they are in every game. JT – Once again Johnathon Thurston is the star of the show but Jason Taumalolo is a very close second. The Cows are well poised to repeat. They seem to be pacing themselves. The Sharks and the Storm are playing better but anything could happen in the Final series. They should get Michael Morgan back soon. Other than that there are no significant injuries. They have Johnathon Thurston and as long as they can say that, the Cows are never out of it. I have said this a thousand times. The Storm are defying the laws of physics. What they are doing is impossible. They keep unearthing these amazing players. Suliasi Vunivalu is leading the try scoring charts with 16 and he has only played 10 games. Cheyse Blair and Ryan Morgan are playing the best they have ever played. Cooper Cronk and Cameron Smith are playing like they are in their mid-20s and their All-Kiwi-All the Time Pack is chewing up the middle of the field. Defence, impregnable. Craig Bellamy, angry. Situation normal. Cooper Cronk – Cronk has been sublime and remains one of the premier halves in the game. If it wasn’t for JT he would be the best half in the game. Cameron Smith is also having a tremendous season but his work is so seamless he is barely noticed. It is pretty much the Sharks, the Cows or the Storm. That’s it. I can’t split them. I thought the Sharks had a great First Trimester but their Second Trimester was even better. They’ve now won 13 games in a row, which is a club record and that includes some marquee scalps like the Cows, Broncos and Storm. They are the complete package too. Strong yet mobile in the forwards. Canny dummy half. Playmakers at the peak of their game. Feisty. Great defence. Strike power across the paddock. Ben Barba – Hard to pick because the whole team is playing well but Ben Barba is finally starting to resemble 2012 Ben Barba. And then there were 3. As previously mentioned, unless the Broncos can arrest their worrying slide it is pretty much down to the Sharks, Cows and Storm. The Sharks haven’t looked this good since 1988 and I vividly remember them going out in straight sets so I’m not anointing them to break their drought just yet but they are certainly within striking distance. Dubs picking up KD. Reloading never looked so good. Portugal. Winners of Euro 2016. Against all odds. NBA Summer League. With Ben Simmons and Thon Maker playing, I have never been so interested. Dubs trading Andrew Bogut to the Mavericks. Probably an insight into how Australians pick a club from another country to follow. Unless we have any ancillary reason to follow a club (for instance, a relative came from that part of the world), we follow players rather than clubs unless there aren’t any players to follow and then we pick for other reasons (playing style or jersey colour). Penalty shootouts. There has to be a better way of deciding games. We’ve officially had a draw. Happens when Sportsbet sets the line at an even number. Why do they do that? Now I have to completely change the way I am scoring. OK. Here we go. It doesn’t matter how I score it, I’m still batting below 0.500. BTW I’m having a big break and heading to Thailand, Malaysia and Singapore. Next exciting episode will be on Saturday, 27 August 2016 titled ‘2016 Olympics – The Good, the Bad and the Ugly’.